including tips for your biotype. We all want to reduce stress and increase physical and psychological well-being. But none of us is perfect or even balanced. 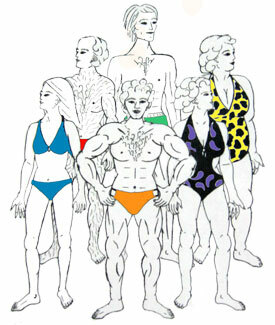 Each of us is unique, with particular assets and strengths, but also specific weaknesses that cause health problems. Stress, aging and disease plague us all. And people suffer different problems. Our strong hormone-producing glands determine our body shape, behavior and metabolism – and our unique gifts and talents. But our weak glands determine our greatest health risks, and contribute to such health problems as: high blood pressure, diabetes, obesity, reproductive problems, poor immunity, allergies, mood disorders, chronic fatigue, premature aging, and more. Millions of people are concerned about hormones, and many already take estrogen, thyroid, DHEA, melatonin, and other hormones. Knowing your Biotype is key to breaking free of stress, aging and disease to fulfill your genetic potential. The Biotype System describes 8 physical and behavioral types based on hormone differences. These differences affect all systems of the body, our appearance and our emotions. Come discover your personal hormone pattern – and get health programs and strategies for balancing and re-energizing your body, mind, emotions, and total health! PHYSICAL: Improve body size and shape. METABOLISM: Improve energy & performance. BEHAVIOR: Balance mood, cognition, and socializing. Nutritional biochemist Laura Power Ph.D., nutritionist Richard Power Ph.D. and UCLA professor Dario Nardi Ph.D. provide you with the latest scientific information on hormones, health and behavior, and present 8 unique types verified by 20 years of original copywritten research. You will find here illustrations and descriptions to identify each type as well as 10 tips to start creating the perfect you, right now! Please find our regular articles by enthusiasts and health practitioners trained in our system as wells our upcoming book, The Biotype System. The greatest benefit goes beyond discovering how and why we are different, to learning tools to heal and balance ourselves, as well as optimizing energy, enhancing relationships and greatly improving our quality of life.